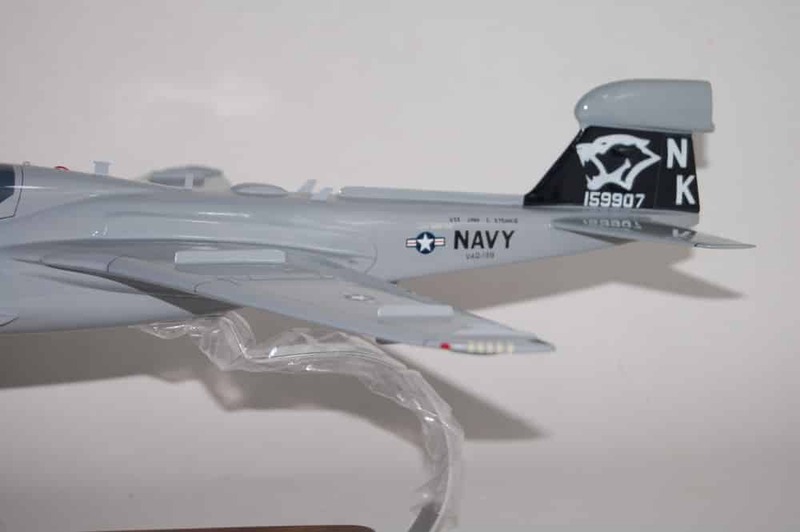 Fly off the USS Stennis again with the VAQ-139 Cougars in this 18 inch EA-6b model. 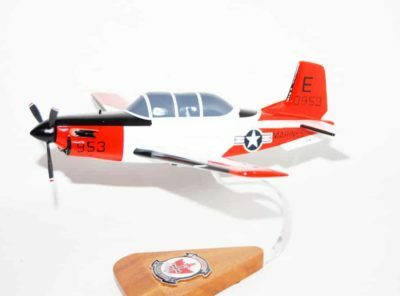 Each model is carefully carved and painted to provide a unique treasure that you’ll love. 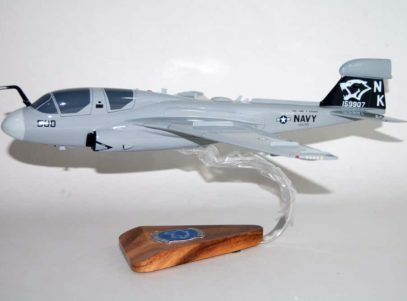 The Cougars of VAQ-139 became operational 1 July 1983 under the command of CDR Richard A. Clark while flying the ICAP (Improved Capability) EA-6B Prowler. During their first year of operation, the Cougars, home-based at NAS Whidbey Island, WA, participated in numerous operations. 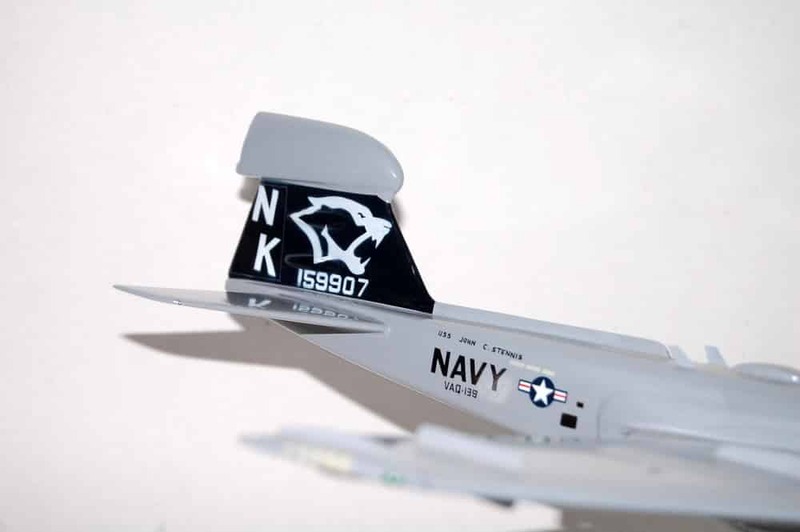 In 1985, the Cougars embarked on their inaugural deployment to the Western Pacific (WESTPAC) and Indian Ocean (IO) onboard USS CONSTELLATION (CV 64) as an integral part of Carrier Air Wing FOURTEEN (CVW 14). The same year they were awarded a Meritorious Unit Commendation. 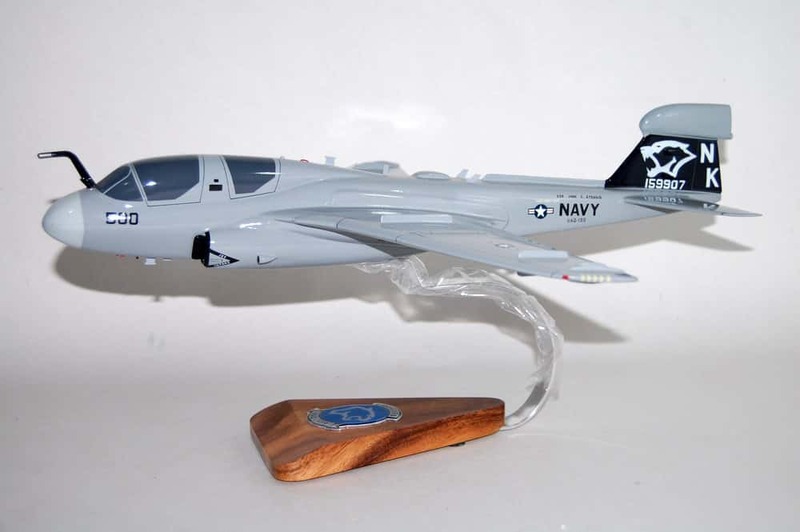 1986 proved to be an outstanding year for the young squadron, as the Cougars were awarded a Navy Unit Commendation and also won the “triple crown” of the Prowler community by winning the 1985 CNO Safety “S,” first place in the 1986 Battle Readiness Competition, and the 1985-86 Commander, Naval Air Force, U.S. Pacific Fleet, Battle Efficiency “E” Award. From April to October 1987, the Cougars went on a WESTPAC/IO deployment on CV-64, which even included carrier operations while at anchor in the Diego Garcia lagoon. They maintained their standards of excellence by earning a second CNO Safety “S” and a Navy Expeditionary Service Medal. 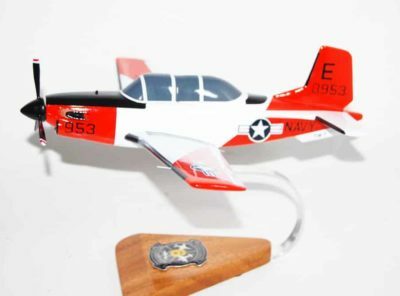 The Battle “E” awarded in 1988 was the squadron’s second consecutive award. 1988 concluded with the Cougars beginning a WESTPAC/IO deployment. After transitioning to USS INDEPENDENCE (CV 62) in late 1989 the Cougars left on a WESTPAC/IO deployment in June 1990. 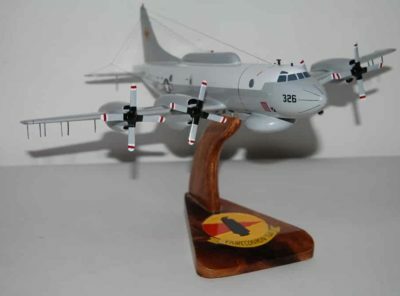 They were an essential part of the first U.S. forces responding to Iraq’s invasion of Kuwait during Operation DESERT SHIELD. The Cougars led numerous missions deep into the Arabia Gulf and significantly contributed to the contingency planning in anticipation of Operation DESERT STORM. 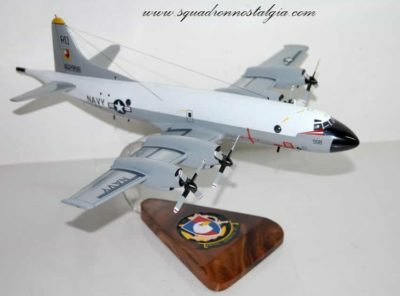 1990 also saw a third CNO Safety “S,” a Navy Unit Commendation, and a Southwest Asia Service Medal awarded to the squadron. The Cougars deployed in support of Operation SOUTHERN WATCH again in 2000. 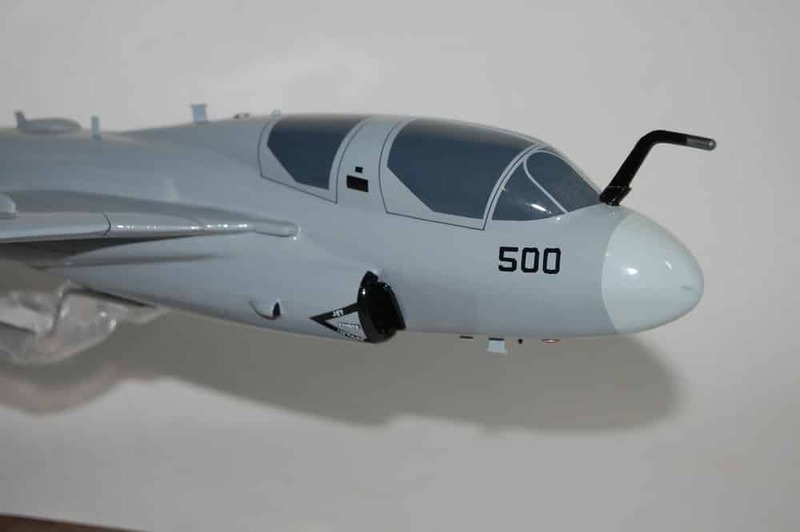 They received the prestigious COMNAVAIRPAC Battle “E” for excellence in combat for the year 2000. 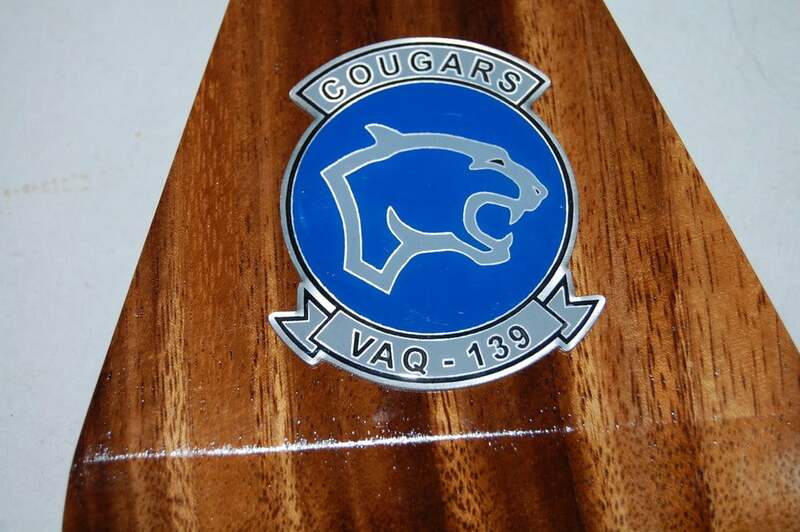 July 23, 2002, the Cougars departed for a scheduled six-month WESTPAC/IO deployment in support of Operations ENDURING FREEDOM over Afghanistan and SOUTHERN WATCH over Iraq, earning them the Global War on Terrorism Expeditionary Medal. 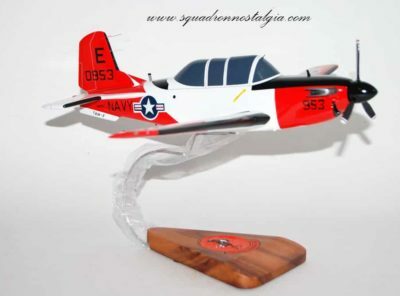 The close of 2002 brought with it numerous awards for VAQ-139. For the third time in the squadron’s history, the Cougars earned the coveted “triple crown” by receiving the Battle “E,” CNO Safety “S,” and Admiral Arthur W. Radford Award. In May 2008, the Cougars began their next scheduled WESTPAC/IO deployment. They supported survivors of Typhoon Fengshen, which had affected nearly five million people in the Philippines. Following their humanitarian work, they headed to the Northern Arabian Sea to support U.S. and Coalition Forces on the ground in Afghanistan in support of the Global War on Terrorism. The Cougars were awarded the Battle “E,” the CNO Safety “S,” and the Humanitarian Service Medal. 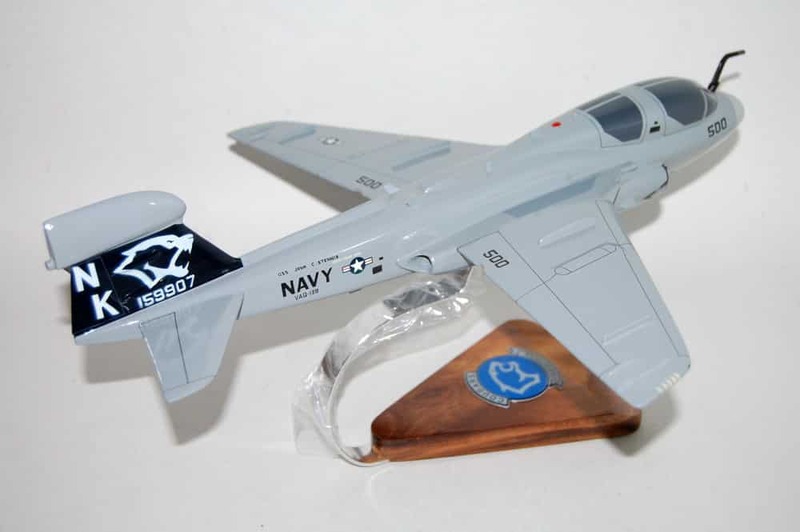 After this deployment, the Cougars transitioned from the battle tested EA-6B Prowler to the state-of-the-art EA-18G Growler. Upon completing the transition, the Cougars began work-ups for their inaugural EA-18G deployment with CARRIER AIR WING 17 (CVW-17). During September of 2013 VAQ-139 conducted the first successful live fire of the AIM-120 Advanced Medium-Range Air-to-Air Missile (AMRAAM). Following this event, the Cougars flew the combat-loaded Growler aboard the USS CARL VINSON for Tailored Ship’s Training Availability (TSTA). After the New Year the Cougars returned home to NAS Whidbey Island. In the spring of 2014 the Cougars participated in AIR WING Fallon and Composite Training Unit Exercise (COMPTUEX). During these events, VAQ-139 exceeded every standard of tactical excellence in the EA-18G. At the completion of COMPTUEX, VAQ-139 was designated combat-ready and headed home to NAS Whidbey Island to make final preparations for deployment. While deployed on what would be the longest carrier deployment since the Vietnam War, the Cougars supported OPERATION INHERENT RESOLVE and provided over 75% Airborne Electronic Attack support in theatre. 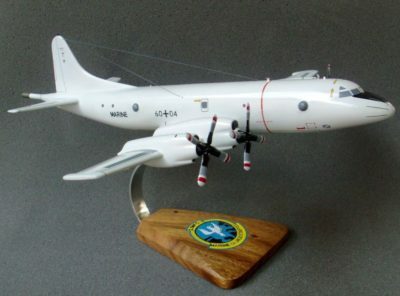 During the deployment, the Cougars were awarded the 2014 CNO Aviation Safety Award, the 2015 Commander Electronic Attack Wing Pacific Fleet (CVWP) Semi-annual Safety “S,” the Commander Naval Air Forces (CNAF) Blue “M,” and the 2014 U.S. Fleet Forces (USFF) Retention Excellence Award. The Cougars returned home in June of 2015. Since returning from deployment, the Cougars have taken part in three detachments at Nellis Air Force Base, and went underway for two carrier qualification periods, thus ensuring a high state of readiness and tactical expertise.